The Admit Card/Hall Ticket for Common Entrance Examination for Design (CEED 2015) to be held on December 7, 2014 are available for download. 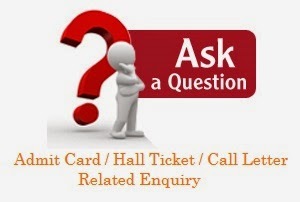 Candidates who have applied for the exam can download their admit cards not later than December 6, 2014. CEED 2015 Conducted by Indian Institute of Technology, Bombay (IITB), CEED is an entrance exam for admission to postgraduate Master of Design (M.Des.) programs to various institutes across India. The announcement for admission to the postgraduate programmes in design will be notified by the induvidual institutes separately. The criteria for post graduate admission and award of scholarship / assistance are different in different institutes. GATE-JAM-CEED office, IIT Bombay is not in a position to provide information in this regard. Brief information about the programmes offered by the participating institues is given on this website. However, for more details, or any specific queries on admission and programme of the individual Institutes, the candidate should contact the concerned head/convenor/coordinator of respective departments. CEED scores are also accepted for Ph.D. programs in IISc, Bangalore and IIT, Bombay. • Enter the registered email id and password details that were sent after registration. For any specific query on admission and programmes, go through the websites of concerned institute given below.